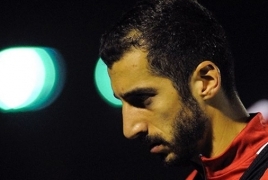 PanARMENIAN.Net - Armenian midfielder Henrikh Mkhitaryan believes that his teammate Matteo Guendouzi has the talent to become one of the best in the world. Speaking to COPA 90, Mkhitaryan said he is impressed with the French international. "He is 19 years old, he has to be focused on football. At 18, 19 years old he's come here and is playing for Arsenal from Ligue 2 from Lorient," he said. "It isn't everyone who can have this chance. I think he has big talent. "We are telling him every day that he has to work very hard, he has to have his feet on the earth because he's still 19 and has to work hard, hard, hard and he can become one of the best in the world."